Note that you can allow either only single vote or multiple vote, plus you are not limited to just 4 answers (choices), but by clicking "Add another answer" you can add one more choice. I haven't tested it, but I assume that it would be possible to add an unlimited number of choices. You can also set the date when the poll should be close, but because the year is limited to 2 digits, from experience with setting post dates, you probably cannot go beyond 31st December, 2009. Plus it don't look like you can have an open dated (no closing date) poll. 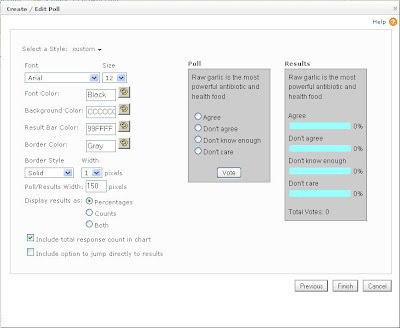 Also, you can only put the poll in the sidebar, Header (if you follow the instructions at Add graphic, poll, ads, etc,. to New Blogger blog Header, in the footer, or above (or below) the main column (post) if you follow the instructions in the post Add search box, poll, ads, etc., to the top (or bottom) of the main column (posts). 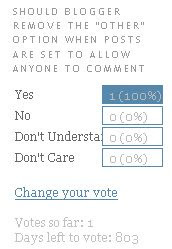 However, you will never be able to add as poll direct into a post with New Blogger. You can see an example of a poll at the bottom of the left sidebar of Testing Blogger Beta (now New Blogger or just plain Blogger). Note that part of one long answer (choice or text) is hidden by the result. 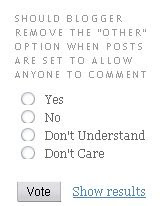 These are the deficiencies with the New Blogger latest feature - polls. If you find the above too limiting, you will have to turn to third party sources. One of them is online polls. I am not clear if the poll is free and there is an extra or upgrade and polls are only a 30 day free trial. However, I believe the poll is free, since the link say "sign up for FREE POLL" and the "Next step" have is a link Get a Free Trial of EFM Feedback (second thought: this mention of "Free Trial" blur the picture a little and now I am not sure if I signed up for a free trial or signed up for something free with option to upgrade at extra cost). 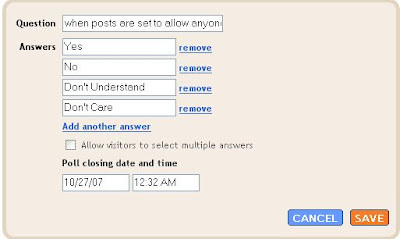 Anyway, I have set up a demonstration poll at Poll: Should Blogger make Autosave an option?. But please don't let the word "demonstration" discourage you from voting, as I genuinely am interested in the result. You will know why if you surf over to the above post. The only question is whether it is an open ended poll or it will stop working after 30 days. I hope you will take the time to vote as it only take micro-seconds and if I get enough response, I will try to submit the result to Blogger as I have been pestering them go give us the option to turn it off when the circumstances require it. I have given some reasons why Blogger should give us that option to help you decide how to vote. Really hope you vote because if I get enough response, I will submit the result to Blogger and hope that if enough bloggers want it, they will give us the option. I also have set up another demonstration poll at Poll: Raw garlic is the most powerful antibiotic plus health food. The difference between the two is that one allow multiple vote (choices) and the other only a single vote (choice). By the way, Free Online polls for blogs only works with Internet Explorer 6.0 SP1 or later, or FireFox 1.5 or later, so if your visitor counter (click BACK button to get back to this page) shows many visitors using other browsers, you may want to think hard about using the poll. Another thing I don't like is that I have used up a lot of my time testing, and have found this irritating thing about this free poll. They use a double opt-in and you must use IE or FireFox to be able to opt-in. Further, after opting in I created a poll, then log out. The next time I tried to sign in again, I get the message "You do not have access to this content at this time" and I have to opt-in once more to get access. It is a great utility to create poll, but I regret to say this, you are likely to meet a lot of irritations along the way. Maybe it is because I was not using the utility the right way and you may have better luck. I suppose if this interest you, you will have to try it out yourself. I may have got my facts wrong. I have previous published a way to add an MP3 player to your blog so that you can have music for your blog at Adding Music to your blog. I received one comment from a blogger: "hey peter thanks for posting these topic...but i dont know why it doesnt work for me!...i have tried a thousand times, and i cant make it work!" again and install Quicktime. Hope this will solve his problem. I have published a post Custom domain for New Blogger, however, I myself never use it for my blogs. Will Blogger blogs be deleted? Test. I will however have to accept the risk that my blogs get marked as a spam blog (splog) and get deleted by Blogger. But if I am still around, I can try to do something about it.